From the center of the state at Lewistown, it is 262 miles to Sidney and just a few miles farther to the Dakota line. At night you can drive 50 miles or more and never see another vehicle. Fly over it at after dark and you rarely notice a light. This far-flung portion of Hwy 200 traverses Montana's loneliest stretch of geography. But loneliness is this huge swath of landscape's greatest asset. 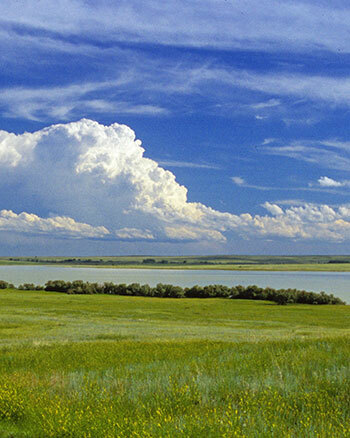 For what it lacks in civilization, it makes up for in the grandeur of the prairie and the echoes of history. Montana Hwy 200, originating at the Idaho border in the northwest part of our state, is your trail across this great section of America. Departing Lewistown with the compass pointing towards the sunrise, the road climbs through the western foothills of the forest covered Judith Mountains, an island uplift in the vast sea of Montana's Northern Great Plains. Atop the pass, to the south you get a glimpse of the elongated mass of the Big and Little Snowy mountains. The view-shed to the northwest brings out the lower lying North and South Moccasins. Gravitating down the east slope of the pass, the northern reaches of the Judiths, marked by the distinct form of Black Butte, are tailing off towards your left. Few ranches are visible on the way to Hwy 200's junction with Hwy 19, coming in from the north. Here, the small community of Grass Range is just one mile down the road. A busy café and gas station sit on the edge of town. For a worthy side trip - assuming that you have several days to complete the journey, head north on Hwy 19 towards Malta. It's 39 miles straight ahead to the Missouri River crossing and the western end of the 1.1 million-acre Charles M. Russell National Wildlife Refuge. The folks at the Sand Creek Wildlife Station at the top of the hill on the south side of the river can give you plenty of information on what to see and do in this wildlife haven. Camp at the James Kipp Recreation site off the Fred Robinson Bridge for the night. When your adventure here is finished, head back south to Hwy 200. Once again moving eastward, it is 23 miles to Winnett, seat of Petroleum County. With the establishment of a Post Office in 1912, Winnett officially became a town and grew on the homestead rush and the discovery of one of the richest pockets of oil at Cat Creek in 1920. The demise of the same events emptied the community. Gas and food are available and it is worth stopping in to visit this place that in its heyday was rollicking and prosperous. Fifteen miles beyond Winnett you will pass over the storied Musselshell River. Roads from here and Winnett lead into the Missouri River Breaks and the CMR Wildlife Refuge. McDonald Creek edges the south flank of Hwy 200 beyond Winnett and empties into the Musselshell. The country along the way consists of a river bottom with pine-covered bluffs to the south and north. After crossing the Musselshell River, the road climbs through high hills with a mixture of sagebrush and an open forest of ponderosa and juniper pines. Up until now, you have been gradually descending from a high plateau that began at the foot of the Northern Rocky Mountains. Lewistown sits at an elevation of 3,963 feet, while Sidney is 1,931 feet above sea level. At milepost 160, an historic sign points out the one-time location of Fort Musselshell on the Missouri River about 35 miles to the north. In the 1860s and 1870s, the fort served as a trading post and stopping place for Missouri River steamboats. The River Crow and Gros Ventre Indians also traded here. The sign points out that other tribes, namely the Assiniboine and Sioux, regarded "this Post as an amusement center where bands of ambitious braves could lie in ambush and get target practice on careless whites." This was a lawless land. Errant cowboys and outlaws considered the rancher's four-footed inventory to be fair game. In 1884, Granville Stuart, often considered the grandfather of Montana, disposed of the cattle and horse rustlers holed up along the Musselshell, especially at its mouth with the Missouri, by subjecting them to vigilante justice carried out by "Stuart's Stranglers." At one time, this area served as a river passage point for migrating bison herds that thundered by the millions across the very land the highway now bisects. On a day when the wind is still, listen and you might hear the shouts of the Indian hunters as they pursued these mighty animals. Indeed, every mile of the way suggests a story of the Plains Indians who frequented this segment of eastern Montana. At about milepost 166, you reach the high point of this stretch of Hwy 200. From the crest, the prairie seems to stretch forever in all directions; broken up by buttes, and coulees, it is anything but flat. An outline of the mountains you left behind is silhouetted against the sunset. The topography to the north of your route is made up of some of the most spectacular river breaks in the nation. The Missouri River cuts a swath through land that rises to a thousand feet above it. All you view is part of the CMR. Though you rarely see buildings, ranching and grazing dominate here. Some of Montana's most historic ranches such as the Bar N and the Mill Iron claimed the land. The distance from Winnett to Jordan is about 70 miles. As the road aims to Jordan from these high pine covered hills, it slowly drops through a prairie of sagebrush, coulees and the occasional clump of cottonwoods, where perennial springs in an otherwise dry land keep the trees healthy. Since there might not be another tree for miles, one wonders how the seeds got to these solitary forests in the first place. From here eastward, the road often undulates like a roller coaster. Occasional tracks head north or south, and if it's dry, they are worth exploring. Twenty-one miles from the Musselshell, you reach the small town of Sand Springs with its general store, school, post office and a couple of houses. In the early 1900s, Sand Springs was considered for the County Seat of Garfield County. At that time, and before the depression, it had two grocery stores, a newspaper, a garage, hotel and a flourmill. Its population is now down to about five and serves 35 postal customers and at this writing there are anywhere from three to five students attending the school. From milepost 202 and beyond, Smokey Butte, looking like an old volcano or a teepee with a somewhat flat top, stands out to the north. Stories have it, Indians used to send smoke signals atop here that could be observed for long distances. About 12 miles before reaching Jordan, you will cross Big Dry Creek, a bit of water that lends its name to a landscape often termed "the Big Dry." Late 1800's photographer L.A. Huffman called it "the Big Open" and National Geographic labeled it "Jordan Country." The independent town of Jordan rises from the banks of Big Dry Creek and straddles Montana Hwy 200. If the weather is warm you will likely see the daily card game going on outside of the fire station. If you're not into touring the local watering holes, the Jordan Drug with its genuine operating old fashion soda fountain, is a good place to stop and wet your whistle. There are a couple of places to stay and Jordan should be your camp for at least a couple of nights. This seat of Garfield County is an entry to some of the most remote and beautiful deep river canyons, badlands and prairie wilderness in the west. The most rugged of the terrain is part of the CMR Wildlife Refuge. The road to Hell Creek State Park, on Fort Peck Lake, 26 miles north of Jordan passes through stately piney buttes and high rises that offer excellent views of some of upper reaches of the Missouri River Breaks, Devil's Creek, Snow Creek and Crooked Creek all north of Jordan are worthwhile places to visit. The Haxby Road east of Jordan leads far out to the badlands and into the breaks. Jordan houses a field station for the Charles M. Russell National Wildlife Refuge. It's on the west end of town. Stop and inquire here about road conditions, maps and other pertinent information. Leaving Jordan, once again moving eastward on Hwy 200, you will cover 37 miles through a landscape often dominated with badlands before arriving at the junction with Hwy 24 leading north towards Fort Peck and Glasgow. Travel slowly through here and pull off whenever possible and enjoy the view. The early morning and late afternoon light brings out the life and character of the sandstone sculptures. Badlands are mini-desserts formed when the vegetation cover is destroyed, usually by wild fire or overgrazing. Water runs off the underlying clay surface and soft bedrock. Erosion starts, gullies are formed and seeds of potential new growth of plants and grasses are washed away or are unable to take hold in the hardened soil. Heavy spring and summer downpours accelerate the process. Steep slopes are etched quickly, and seemingly smooth surface alluvial deposits stand out below them. Soon the entire disrupted area is void of green growth. Hwy 24 offers a scenic side trip. If you would like, spend the night at Fort Peck in the historic old hotel or camp in one of the numerous campgrounds. These badlands and the breaks to the north contain some of the richest fossil beds on earth. A sign in Jordan reads, "Many of the most complete dinosaurs on display in the world were gathered here in Garfield County. The first Tyrannosaurus Rex skeleton came out of these hills in 1902. In fact, four of the six Tyrannosauruses found in the world are from Garfield County." Hwy 24 offers a scenic side trip. If you would like, spend the night at Fort Peck in the historic old hotel or camp in one of the numerous campgrounds. Several access roads lead into the Big Dry Arm section of Fort Peck Lake and the eastern perimeter of the CMR. Badlands, hills and coulees are abundant all the way north. The Sand Arroyo Badlands are of particular interest. Please remember, these side routes are only passable when it is dry. Back on the main trail, Hwy 200, the country opens and one notices an absence of sagebrush and evidence of sod busting. At about milepost 267, a side road leads south to the quiet settlement of Brockway. During the homestead era, life was good here. Today, the train station sits along a rail bed void of tracks and spaces exist where buildings once stood on the carefully laid out streets. A silent reminder of the past. The Redwater River runs through Brockway and parallels Hwy 200 to Circle. Take a gander at the scenic Redwater River Canyon to the south of town. Inquire at Circle or Brockway for directions. The environment after Brockway and on to Circle and the Redwater River Valley displays softer rolling high plains and grasslands. Near Circle, crops become more expansive and undulate across the hills in pleasing geometric patterns. The rough austere terrain has faded out. The old time "cow town" of Circle, picked up it's name from the Circle Brand, one of Montana's earliest ranches. Today, the town is still very farm and ranch orientated. Spend some time here and drop in on another authentic ice cream and soda fountain at Chapin's Drug for a milkshake. Also, be sure to visit the McCone County Pioneer Museum on the west end of town. At Circle, just to confuse you, the road we have been following branches off with Hwy 200S going southeast to Glendive and the main Hwy 200 continuing northeast towards Sidney, which is our destination. To the south of Circle and on the way to Richey, the sandstone bluffs of the Big and Little Sheep mountains come into view. Proving that the pioneers had a sense of humor, these somewhat vertically challenged "mountains" were named after the Audubon sheep living there. Sadly, early homesteaders eliminated the herds of handsome animals and they live on in name only. Be sure to stop and visit the Richey Historical museum for a look at what the local homesteading lifestyle was like. From Circle to Sidney and the Lower Yellowstone River Valley, you'll travel 72 miles. As you near the Yellowstone, land farmed with sugar beets, wheat, corn and other crops are evident. The road also skirts Fox Lake Wildlife Management Area. Stop and see what critters have taken up residence. In 1888, the friendly and inviting community of Sidney was named for Sidney Walters, the young son of a local pioneer family. Sometimes called the Sunrise City, with 5,000 people, it is the largest town in northeast Montana. Stay here overnight and explore some of the badlands and breaks of the Yellowstone River just south of town, as well as historic Fort Union to the north. This is also "Confluence Country,” the meeting of the Missouri and Yellowstone rivers. Some of Montana's earliest recorded history was played out here on the eastern fringes of our state. From the 1830s to the 1850s, the place held supremacy over the fur trade business of the Upper Missouri River, and north of Sidney, on April 27 1805, Lewis and Clark and their Corps of Discovery crossed into what would become Montana Territory. This is the eastern end of your journey and you are once again in the arms of civilization. Whether you picnic in one of the lovely treed parks, play a round of golf or tour the outlying area, don't miss the Mondak Heritage Center. A combination art gallery, gift shop, library and reference facility and wonderful local history exhibit. A stop here will give you a better understanding of the sites you encountered along "Lonesome Hwy 200," which once you get to know it, isn't so lonesome after all.